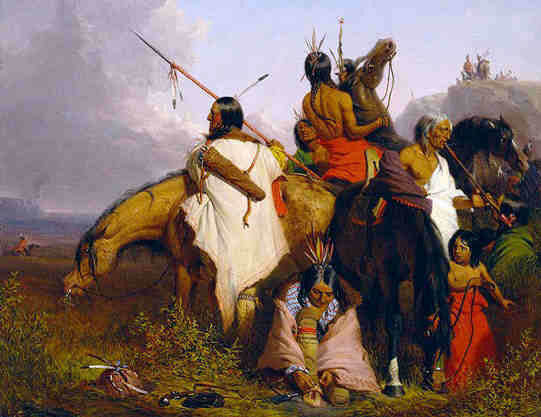 Description and Definition of a Quiver: A Quiver is a portable sheath that contains arrows to be carried on the person. The size of a quiver was dependent upon the type of bow used, the length of the arrows and how many arrows were required. Native American Quivers have been traditionally made of leather, bark, fibers, wood, furs and other natural materials. The choices of material used to make quivers needed to be strong enough so that the quiver would not be pierced by the arrows. The arrows were typically placed tip side down in the quiver. Quivers were often made from pelts from animals such as the fox, otter, coyote and beaver. The arrows in the quivers needed to be accessible so that a person shooting a bow could quickly extract an arrow. Most quivers therefore had an open or 'flip-back' top and was seamed or closed on the bottom and sides. Quivers were carried across the back or slung over the shoulder but carried on the side or hip. The fast release of arrows was essential whether used for hunting or for fighting. Native Americans were able to make one shot every 3-4 seconds at a range of about 200 yards.